Whether you’re renovating your old home or designing a new space that’s comfortable and allows you to bring natural light inside, the VELUX CABRIO Balcony is the ideal solution. VELUX is a market leading window and skylight manufacturer and the VELUX CABRIO Balcony is one of its triumphs. This innovative balcony will allow you to open up your roof, loft or attic, allowing light to flood in and fresh air to circulate. Even if your home is small or you live in a bustling, built-up area, you can create a calming space that opens out to the skies. With the VELUX CABRIO Balcony, you can create a modern, practical space in your property by introducing these stylish and practical balconies. In fact, VELUX products were originally designed with this idea in mind. Danish inventor Villum Kann Rasmussen created VELUX windows in the early 1940s with a vision to bring light and fresh air to ordinary people’s lives and change their quality of life. Over the years, VELUX windows and skylights have become one of the most popular choices for property owners in the UK and VELUX CABRIO Balconies are no exception. The VELUX CABRIO Balcony fits nicely into the slope of your roof like any other roof window. But the beauty of the CABRIO Balcony is that when opened, it turns into a stylish little balcony so you can breathe in the fresh air and relax as you take in the panoramic views of your surrounding environment. The genius of these miniature balconies is that they are so practical, converting from a simple window to a balcony in seconds. The upper window is top hung and opens outwards and the bottom, reinforced pane unfolds and turns into a clear, glazed balcony with side rails that automatically appear for safety when the bottom window is opened. With the VELUX CABRIO Balcony, you have the best of both worlds – you’re in the safety of your home, standing with your feet on the ground but feeling like you’re a million miles away, enjoying the outdoors that has opened up for your benefit. VELUX CABRIO Balconies can also serve as an emergency exit, which is ideal for your home office or loft conversion. As with all VELUX windows, the quality is superb. The CABRIO Balcony has safety features such as toughened outer glass and laminated inner pane and safety glass on the lower section. These balconies are suitable for a large variety of properties, from commercial premises to domestic buildings. They can transform your home inside and out, adding a touch of class and creating the perfect space indoors for you to relax and enjoy the sunshine. 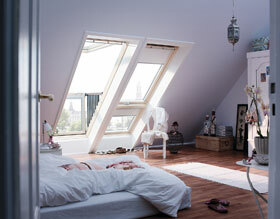 VELUX has a vast range of roof windows and skylights to choose from. Choose a 5-star VELUX installer such as G&A VELUX Roof Window and Skylight Specialists, to help you install the right roof lights for your property. G&A is a VELUX specialist with many years of experience in supplying and fitting VELUX roof windows and skylights. We offer competitive prices and we can often install VELUX windows without using scaffolding so our service is cost-effective and convenient. Call G&A today and let us make your vision into a reality. Contact the team on 0800 626430. Please can you advise how much it would cost to install a Velux Cabrio window in a SkandiaHus chalet-style house in Suffolk?